I fixed my toilet over the last few days–twice. The first time it became necessary was on a Thursday evening toward sunset. I pulled the handle down to flush–and nothing happened. I’ve lived in old houses with old toilets for most of my adult life.I even lived with one that had to be entirely replaced shortly after I moved to the house on Van Buren Street–so I knew what to do, at least for starters: take my pretty little things off the top of the toilet tank, and lift that top off to see what was going on inside. I’ll add, too, that, for me, there’s an in between step: put that top down far enough away that I won’t back up and trip over it and in a stable enough place that it won’t fall (so the edge of the bath tub is out). Once I had that heavy top off, it was easy to see what the problem was: the chain had broken away from the flap. It’s been a while since I’ve had my hands inside a toilet, and of course I forgot that I could turn the water off to it and work with an empty tank. The water was cold. But soon I knew exactly what had to be done. And in the end, working with a little water in the tank may have actually helped me out. It was that time in the evening when all the plumbers have already packed up their tools to go home for the night, so I texted a neighbor about coming over to help. He was out watching the sunset and said he would be by after that. In the meantime, I thought I’d give things a go–with a paper clip. The part that connected the pull chain to the top of the flap had broken or disintegrated, so it was time to jerry rig. I opened a paper clip and did my best to weave it into the chain link and then figure out where I could connect it to the flap. The ring on the top of the flap had flown off in the snap, and so there was no way to reconnect it there. It had to be on one of the arms of the flap. Let me just say that the world is made for right-handers. It was really hard to get the paper clip ends through the openings with my left hand leading because I kept running into the pump, but I finally did it. My hands were pretty cold, from the cold they were wading in. Nevertheless, the toilet handle hesitated a little, and then flushed. I had made it work. And what’s more, it somehow, jerry-rigged as it was, worked better than it had before it broke. For some time in the past year, maybe the whole year since I’ve moved in, that toilet has become more and more talkative (I actually call it “my talkative toilet”). It will “strike up a conversation” all of a sudden, when I’m nowhere near the bathroom, in the middle of the night, during a nap, etc. It’s not unpleasant–it’s the sound of water running and then trickling. But I began to wonder what it meant and noticed it happened more frequently. Perhaps this talkativeness occurred because the chain was wearing out and the flap wasn’t sealing. But now, it was quiet, completely quiet, unless I flushed it. I could hardly believe it. I still, though, had the notion that maybe that paper clip fix should be more secure, made “better” by someone with stronger hands (read, here, a man). There was a little drag on the handle when I pushed it down to flush that hadn’t been there beore. I wrestled with myself–I had texted my neighbor and told him I thought I had fixed it, but maybe he should come by and take a look at what I did. But then a few minutes later, I got up the courage to say it was fine, and that he didn’t need to come over. The toilet worked beautifully overnight and into the next day. And yet still, I thought of this as a temporary fix. I wasn’t sure it would hold. I texted a friend who had referred me to a plumber when my garbage disposal stopped working. This plumber had talked me through some extra steps to get it to go, and didn’t charge me. He was a nice guy so I called him. First he asked me what kind of toilet it is. I didn’t know, or know there was a brand on it (but now I know–I’ve even found the model number). Based on what I was telling him, he started to tell me it might be cheaper just to buy a new toilet. I told him I didn’t want to do that. I like my toilet. It’s lower than some of the newer ones and just right for me. I just wanted to fix the innards. I said the only other time I’ve had to pick out a new toilet I lived in a small town and could walk to the plumbing supply place and literally sit on all the toilets in the show room to see which one was best. “That’s not an option in this situation as far as I can tell,” I said, and we both laughed. “It’s $95 on hour,” he said, trying to prepare me. I told him I would think about it and call him back. That same afternoon the contractor who built my fence and who fixed the roof after the raccoons opened it up last Spring was coming by to take a look at a place up on the house where some siding had cracked and blown away. Holding on to the thought of my fix as temporary, continuing to believe it might be in need of a strong “boy’s” hands to make it more secure, I had asked him to take a look at it when he stopped by, and maybe tighten it up a little. I don’t know why I continued to think it needed this, since it worked better than it ever has. I feel sad that I was so willing to give my accomplishment away without even realizing that’s what I was doing. I watched as he worked on it. He turned the water off (smart!). He decided he would change it to open wider for a bigger flush (not needed). He redid the paper clip thing (from a right hander’s position–awkward). In the course of this process, the flap began to dribble an almost continuous leak. After fiddling with it for a long time he was unable to stop the dribbling. He suggested the flap was shot. He also said when I did get a new one to be sure to wipe everything down it touched so it would seal properly. He did not have time to fix it himself, having just stopped by in the middle of a kitchen remodel. Although I do have a half bath up in the loft, the stairs are steep and going up there in the middle of the night to pee is not a good idea for me. I decided to call the plumber back. I told him what had occurred, and that the toilet was now running continuously. “How long is the chain?” he asked. “If the chain’s too short it will leak more.” It was true that my contractor friend had shortened the chain. I tried to fix that from the top end, because at that point in time my hands and I were too tired to get in there and wrestle with a paper clip twisted in by a strong guy, and at a right hander’s angle, to boot. So I took apart the top end and lengthened the chain a little from there. It worked. I called the plumber back to thank him and he said, “I might have to hire you as an apprentice!” and we both laughed. 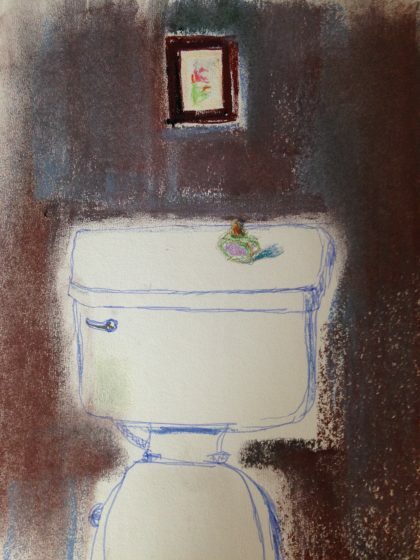 We both peered into the toilet, comfortable and good-natured together, and wondered how to get it to stop. She suggested it was possible to take this part out and go on a field trip to see if we could replace it. That actually sounded kind of fun to both of us, just for the triumph of it, but I already had a ride to Newport for groceries later and had not eaten or walked the dogs, and wasn’t sure I had the stamina to add another expedition to the day. Plus what if we couldn’t get it back in and make it work? We decided it would better if I called one of the plumbers. In the middle of this, I got a text from my contractor friend, and I answered him back, using the dictation function on my iphone. My neighbor laughed and said “So THAT’S how you send me these long texts! I’m over here with my thumbs. . .show me how to do that!” So we laughed again, and I got to show her where the little microphone button is and how to turn it on and off. I had left a phone message with her plumber. When he called back– I learned he charged thesame rate, and had the same don’t work on weekends policy. He gave me the name of a plumbing supply place if we wanted to try replacing the flap ourselves. I was back to my own devices. But I had learned a few things. During the short time we had entertained buying the part, I had talked to a guy at that plumbing supply place recommended by the plumber. All of them, the guy at the store, the plumber, my contractor friend, had said be sure you clean around the edges when you get a new flap because any little bit of material stuck on it will prevent the seal. Suddenly it occurred to me, what if in all this fiddling my contractor friend had done the previous afternoon something had gotten onto the flap where it seals and was making it run so much? If I should clean for a new seal, why not try it with this old one? And so I got out a cloth and wiped. I also decided somewhere in there to take apart my contractor friend’s right handed fix and put everything back to the way I had originally had it. It took me a while to get his apart, but I did it. And then I used a new paper clip, one coated in yellow, which made it easier to see where it was when I tried to thread it through the available openings. There was indeed something stuck at the edge of the flap. I felt it give way as I wiped with the cloth. I’ve got the dang thing working again, and it isn’t running continuously, though it does murmur a bit now and then or after a flush sometimes. I realize my toilet needs some new innards and that sooner than later I am going to have to shell out the big bucks to one of these nice plumbers to do the deed. But the real take away from this for me is the sharp object lesson I got about learning to trust that I know what I’m doing, that my hunches are sound, even in areas that have mostly been relegated to men in my life that have helped me hold my houses together. I didn’t need anyone to fix what I had fixed. And because I believed I did, I ended up having to refix it back to the way I originally fixed it. This lack of confidence started long ago in my marriage when as a younger woman I was told I could not hang a picture correctly, or even load the dishwasher right. When I left that marriage I had to slowly regain confidence to do even the most basic things. That doubt sometimes still lingers, if not directly from the scathing criticisms, then from years, a lifetime really, of generally being physically weaker and having less stamina than most of the people around me. I tend to see the “normal” strength others have as a kind of “super hero” power I do not possess and that if things are to get done right, then someone more “normal” should do the honors. But just as often that isn’t true at all. I still have a hard time grasping that sometimes. I thought about starting this post last night, but I knew I had to sleep on it–not so much to make sure the toilet is still working–it is–but in order to let my own belief that I had actually fixed it adequately for now sink all the way in. I had to sleep on trusting my unusual affinity to align with inanimate objects in what I’ll call a spirit of cooperation, despite how strange that may sound. I had to give myself some time to fully acknowlegde that getting into a space of cooperation and concentration and above all self-trust helped the whole thing go better, because then inspiration (like why not clean off the old flap and see it that helps?) has room to make itself heard. As I may have mentioned in a previous post, I have begun rereading all my blog posts in order from start to finish in my geologically slow effort to shape a draft of a memoir. I am now up to “Zen Chores,” which I often think of as one of my greatest victories and favorite posts. In it, I wrote, I celebrate the help my neighbors on Asbury Street gave me over the years with chopping wood and carrying water, and my own amazement and joy when I discovered I had become strong enough to lift a 3 gallon water bottle onto the ceramic water crock. During that time in my life, I had the benefit of people around who knew what things had been like for me before I changed the way I eat. In Portland, and here at the coast, I don’t have that. People here don’t know what a miracle it is that I walk around every day with my dogs, or get up and down the cement stairs to the beach. When I tell them I can’t walk over rocks that have blocked the way to the sand, they just have to trust that I know what I’m talking about. And it’s up to me to trust myself about what I can do–as well as what I can’t. Sometimes that can be a daunting task, but it’s always a worthwhile one. I know we’re told all the time by experts and studies how the most rapid cause of aging or debilitation is isolation, not having enough social contact or support. Although I know it’s important, I wonder about those findings nonetheless. It’s true that I’m uplifted and encouraged and literally helped by those around me quite often. But it’s also true that without trust in myself and my abilities (or limitations) at any given moment, if I allow such trust to elude me or I find it too hard to believe in, no one else’s help can ever fill that void. So call me stubborn, or as I called myself in Zen Chores after my son did, Badass. Or maybe I’m just lucky enough that the things I’m willing to try occur to me in the first place. Whatever brings it on, the most basic tool in my survival kit is the ability to listen to–and trust in–my own responses. I just have to remember to do it. I love your posts. This one was quite inspiring. Keep writing and painting. Oh I have been meandering over the last few months and have many of your past posts to read so I can catch up. Delightful — Being a plumber’s daughter I can so relate — and have fixed the innards of a few old toilets myself. Isn’t it wonderful to find out how strong and resourceful we really are. The part, the flap with chain attached,is less than $5…and super simple to replace. Please don’t pay a plumber to do that for you. What you have done already is more work than what you will need to do to replace it. You can do this. Love your life adventures! Good for you on taking on such tasks! I’m the kind of gal that loves doing things such as this! Hope all is working well, and if it doesn’t work, replace the flap and chain! You can do it! Take care. It’s incredible how things so far in our past still haunt us today – still hammer away at our confidence. And all the many more positive experiences can never quite drown that out. Human brains, huh… I’ve always tried to fix things myself (or with Mark) – thinking, well, if I mess it up, I’ll have to call someone anyway, so why not try to fix it first – it’s cheaper, and I’ll learn something! Though plumbing and electrical are always the “scariest” (read, most expensive and most zappy), it’s those I try to fix myself first, to help gain that confidence that I can take care of my home (not to the extent of rewiring a house, but changing a light switch/putting in a dimmer/replacing a fuse, etc). Anyway, kudos to fixing the toilet! I hope your home repair skills continue to grow, and perhaps your social interaction will include helping others fix things – and not needing the help for yourself! ps- sorry about my absence as of late! Just been separating a bit from certain social media (namely FB). I’m more now on Instagram (are you on that?) – “veronicadoesstuff” if you are. Just lots of photos and less words, which I’m better at!